Everyone knows that Rodney's Oyster House is the go-to place for oysters and surprisingly my first visit there was a few days ago. I never really intended to write a review during that visit but something(s) really impressed me during my visit which I believe are worth mentioning and sharing. So here's my visit to Rodney's during Low Tide hours (3-6pm) where you'd expect "happy hour service" and cheaper food but I somehow ended with much more than that. 2.5/5 - Sorry for the lack of picture here but again, I never really intended to blog about this meal. All I can say it that it's a decent chowder but it tastes very ordinary. My chowder in particular had a ridiculous amount of potato chunks in it and being the not-very-potato-lover I am, I pretty much drank all the soup and left all the potatoes in the dish. I never really voiced my dislike of the dish but my server noticed the unbalanced soup:potato chunk ratio and commented on it. I kinda chuckled but the soup didn't really bother me. *SPOILER ALERT* This actually got taken off my bill. 4/5 - I think my all time favourite steamed mussels have to be from Chambar but wow the mussels here are easily in second place. It's a simple blend of flavours from the butter, garlic, and wine that works well with the 20-25 fat and juicy mussels. 5/5 - Okay after eating these fried pieces of heaven, I don't know what all the fuss is about raw oysters. WHERE HAVE THESE PAN FRIED OYSTERS BEEN ALL MY LIFE?? In an (oyster) shell, this dish features massive oysters fried in a delicate and crispy layer of bread crumbs and is each served on an oyster shell (how cool is that?). It smells amazing and the oyster tastes like meat, I kid you not. Oh and the tartar sauce is so bomb. 4.75/5 - Great fresh oysters with a great variety of condiments ( whoever named the White Boy Soul has great humour). 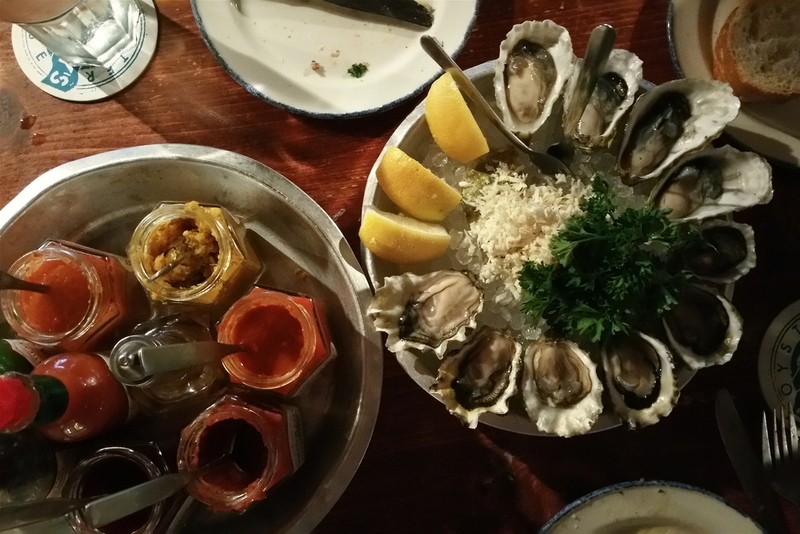 *SPOILER ALERT AGAIN* guess what, EVEN THE RAW OYSTERS GOT TAKEN OFF OUR BILL...?! 4.5/5 - Okay so this was pretty unexpected but to make up for my potato-ful clam chowder earlier, Luis managed to pull some magic and offered us this cheesecake on the house. I never thought to order this one but wow am I glad we got to try this. Surprisingly I'm not a fan of cheesecake so I was reluctant to try it at first. Fortunately I took a bite and ended up battling for each piece with my friend. It's all sorts of vanilla creaminess with an amazing crust. I mentioned it already but i got free vanilla cheesecake. Need I say more? The craziest thing was that my friend and I never complained about anything, we just acted the same way we do in any restaurant and stayed calm...and there we were being rewarded for doing just that. I'm not saying that I expect this service from every restaurant now but I just want to give some recognition to a server (and restaurant) for really going above and beyond to give us a positive experience. So...3/5 dishes on the house + delicious food (excluding the clam chowder) + great customer service = guess who's coming back?